Welcome to our website. 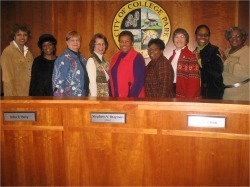 The elected women of Prince George's county hope you find it useful. While our main focus is elected women at the municipal level, those from all levels of elected and appointed government offices are welcome. We encourage you to join the organization. The purpose of this organization is to provide encouragement, education and support to appointed and elected municipal officials, as well as a forum for discussion, and exchange of ideas, and any other lawful purpose. The members of P.G.E.M.W. firmly believe in giving back to the community through a multitude of venues. As elected officials, members give back to their communities on a daily basis. Through workshops, seminars, and guest speakers, P.G.E.M.W. takes an active role in educating themselves about political issues that affect Prince Georgians. Additionally, the organization gives scholarships to graduating high school seniors.